I absolutely love it – no matter what time or place, I won’t refuse a cold one. So you can imagine why I was pretty excited when I heard that Celarevo brewery (now part of the Carlsberg Serbia company) opened a beer museum! The Beer Museum, set inside the brewery complex in the small northern town of Celarevo, will showcase how the process of beer-making evolved in this region. 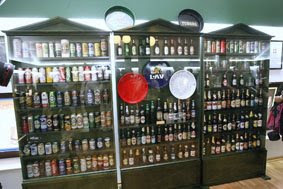 Although people were traditionally more inclined to wine or schnapps, beer became more widespread in the 19th century. Now it’s the most popular alcoholic drink in the land. Celarevo brewery was established in 1892, and although there are older ones in the country (Apatinska brewery began working in 1756); this is still an impressive history of uninterrupted production. I trust there will be things to see in the newly opened museum. Of course, a chance to try out some of the beers from the current Celarevo production line like Lav and Tuborg, and then compare those to other big European brands like Kilkenny or Guinness isn’t either going to spoil the trip to this, shall we say, house of learning.